With a 1730 John Deere Narrow-Row Planter, you have the convenient mobility of an integral planter and twice the planting versatility. 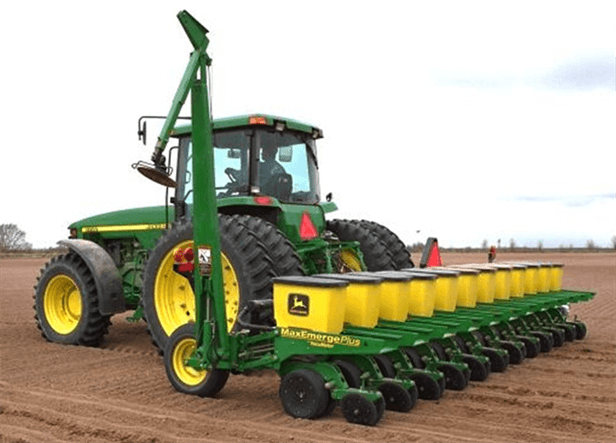 Plant 6 or 8 rows of one crop on 30, 36, 38, or 40 inches;then lower the "splitter" row units to plant 11 or 15 rows at half the row spacing. Or with wheel skips, you'd have a 9- or 13-row planter. To help keep soil and residue flowing through, splitter units are set back 7 inches on extralong parallel arms. You can also mount most row-tillage attachments to the heavy-duty 7x7-inch main-frame. A front-mounted seed transmission is driven by a gauge wheel to give you 50 rate selections,just like the rearmounted drive.